Guatemala, officially the Republic of Guatemala (Spanish: República de Guatemala, IPA: [re'puβlika ðe ɰwate'mala]), is a country in Central America, in the south part of North America, bordering Mexico to the northwest, the Pacific Ocean to the southwest, Belize and the Caribbean Sea to the northeast, and Honduras and El Salvador to the southeast. From the 3rd century BC to the 12th century AD, the lowlands of Petén and Izabal regions were inhabited by several indigenous states of Mayan ethnicity. Many K'iche tribal groups were on the central highlands. The Spanish failed to conquer the Alta Verapaz area by force, but later succeeded through the Catholic Church. A few missionaries, most notably Fr. Bartolomé de las Casas, defended the native population from the cruelty of the Spanish army. The church, however, had a policy of burning Mayan texts, and almost all of the precolumbian manuscripts were lost. A few survived, however, including: " Popol Vuh", "Anales de los Kakchiqueles", and "Chilam Balam", books that were discovered and preserved by Spanish missionary friars. The name "Goathemala" was given by the Spanish conquistadors, and derives from indigenous words meaning "Land of many trees". During the colonial period, Guatemala was a Captaincy General (Capitanía General de Goathemala) of Spain, and a part of New Spain (Mexico). It extended from the Soconusco region - now in southern Mexico (states of Chiapas, Tabasco) - to Costa Rica. This region was not as rich in minerals (gold and silver) as Mexico and Peru, and was therefore not considered to be as important. Its main products were sugarcane, cocoa, blue añil dye, red dye from cochineal insects, and precious woods used in artwork for churches and palaces in Spain. On September 15, 1821, Guatemala became independent. The new Guatemalan Republic included part of Soconusco region, and what are now the countries of El Salvador, Honduras, Nicaragua, and Costa Rica. Its 1.5 million inhabitants were concentrated in urban centers. In October 1944, dictator Jorge Ubico was forced out by a student-led revolution. This led to the election of Jose Arévalo, the first democratically-elected president of Guatemala to complete exactly the term for which he was elected. His "Christian Socialist" policies, inspired by the U.S. New Deal, were criticized by landowners and the upper class as communist. This period was also the beginning of Cold War between the U.S. and the USSR which was to mark Guatemalan history. In 1954, Arévalo's freely-elected Guatemalan successor Jacobo Arbenz was overthrown by a small group of Guatemalans backed by the U.S. Central Intelligence Agency (CIA), after the government expropriated unused land owned by the United Fruit Company, a U.S.-based banana merchant. The CIA codename for the coup was Operation PBSUCCESS, its second successful overthrow of a foreign government. The subsequent military rule, beginning with dictator Carlos Castillo Armas, led to over 30 years of civil war that, from 1960, led to the death of an estimated 200,000 Guatemalan civilians. Due to the military's use of rampant torture, disappearances, " scorched earth" warfare and many other brutal methods, the country became a pariah state internationally. From the 1950s to the 1990s (with a suspension of military aid between 1977 and 1982), the US government directly supported Guatemala's army with training, weapons and money. The United States Army Special Forces (Green Berets) were sent to Guatemala to transform its army into a "modern counter-insurgency force" and made it the most powerful and sophisticated in Central America. CIA involvement included the training of 5,000 Cubans opposed to Fidel Castro and airstrips in its territory for what later became the failed Bay of Pigs Invasion in 1961. In 1999, then US president Bill Clinton stated that the United States was wrong to have provided support to Guatemalan military forces that took part in the brutal civilian killings . Since the peace accord, Guatemala has enjoyed successive democratic elections, most recently in 2003. However, corruption is still rampant at all levels of government, and political parties are numerous and unstable. A huge cache of National Police files discovered in December 2005 revealed methods of public security officials to quell unrest of citizens during the Civil War . Politics of Guatemala takes place in a framework of a presidential representative democratic republic, whereby the President of Guatemala is both head of state and head of government, and of a pluriform multi-party system. Executive power is exercised by the government. Legislative power is vested in both the government and the Congress of the Republic. The Judiciary is independent of the executive and the legislature. 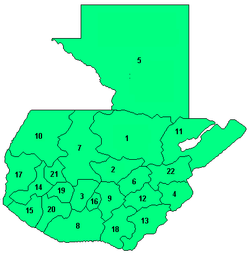 Guatemala is divided into 22 departments (departamentos) and sub-divided into about 332 municipalities (municipios). Guatemala is a heavily centralized state resembling France in that respect. Culture, transportation, communications, business, politics, clubbing, and most relevant urban activity takes place in Guatemala City which is the most modern city in Central America. This preeminence makes the office of mayor of Guatemala the second most powerful political position in the nation, after the presidency and is usually a stepping stone towards it, Berger was mayor before becoming president of Guatemala. Guatemala City is relatively large with about 2 million inhabitants within the city limits and more than 5 million within in the urban area. This is a significant percentage of the population (12 million). Throughout history Guatemala has undergone many changes. Some of these changes were minor, and some had great effects on the country. Since the development of modern civilization in Guatemala, it has dealt with a series of political issues. These issues, unique in various ways from other countries in the Central American region, have dealt with rulers of many different sorts. Guatemala is a beautifully political mass of land that is distinguished from the rest. Guatemala is mountainous, except for the south coastal area and the north vast lowlands of Peten department. Its climate is hot tropical – more temperate in the highlands, and drier in the easternmost departments. All major cities are in the southern half of the country. 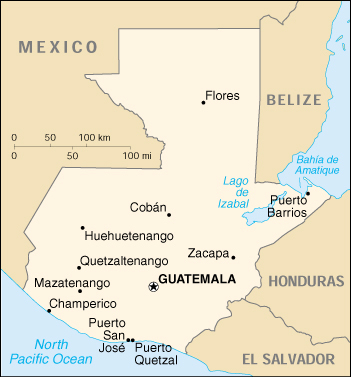 Major cities are the capital Guatemala City, Quetzaltenango and Escuintla. The largest lake Lago de Izabal is close to the Caribbean coast. Guatemala's location on the Caribbean Sea and Pacific Ocean makes it a target for hurricanes, including Hurricane Mitch in 1998 and Hurricane Stan in 2005, which killed more than 1,500 people. The agricultural sector accounts for one quarter of GDP, two-thirds of exports, and half of the labor force. Coffee, sugar, and bananas are the main exports. Manufacturing and construction account for one-fifth of GDP. Also economically important are remittances, "remesas" in Spanish, from Guatemalans working in the U.S., largely on an illegal and temporary basis. The signing of the peace accords that ended the decades-long Civil War removed a major obstacle to foreign investment. In 1998, Hurricane Mitch caused relatively little damage to Guatemala compared to neighboring countries, especially Honduras. Remaining challenges include beefing up government revenues, negotiating further assistance from international donors, and increasing the efficiency and openness of both government and private financial operations. In 2005, despite massive street protests, Guatemala's congress ratified the Dominican Republic - Central American Free Trade Agreement (DR-CAFTA) between several Central American nations and the U.S.. However, owing to the extensive damage and economic impacts caused by Hurricane Stan in October 2005, the government is evaluating how it will be possible to implement the mechanisms and stipulations of the DR-CAFTA by the starting date in February of 2006. According to the CIA World Fact Book, Mestizos, known as Ladinos in Central America, (mixed Amerindian-Spanish, or pure Amerindian but Spanish-speaking) and people of European descent (primarily of Spanish, but also those of German, English, Italian, and Scandinavian descent) comprise 60% of the population while Amerindians comprise approximately 40% ( K'iche 9.1%, Kaqchikel 8.4%, Mam 7.9%, Q'eqchi 6.3%, other Mayan 8.6%, indigenous non-Mayan 0.2%, other 0.1%). Other ethnic groups include the Garifuna who are descended from African slaves and live mainly in Livingston and Puerto Barrios, and other blacks and mulattos which account for 1-2% of the population; Arabs of Lebanese and Syrian descent, and Asians, mostly of Chinese descent, compromise around 2% of the population. There is also a growing Korean community in Guatemala City and in nearby Mixco, currently numbering about 50,000. Though most of Guatemala's population is rural, urbanization is accelerating. Guatemala City (approx. 3 million residents) is expanding at a rapid rate, and Quetzaltenango, the second largest city (approx. 300 thousand residents), is growing as well. Rural-to-urban migration is fueled by a combination of government neglect of the countryside, low farm gate prices, oppressive labor conditions on rural plantations, the high concentration of arable land in the hands of a few wealthy families, and the (often unrealistic) perception of higher wages in the city. Generally impoverished farmers move to the outskirts of the city in precarious dwellings on the slopes of ravines. The predominant religion is Roman Catholicism. Protestantism and traditional Mayan religions are practised by an estimated 33% and 1% of the population, respectively. It is common for traditional Mayan practices to be incorporated into Christian ceremonies and worship, a process known as syncretism. In 1900, Guatemala had a population of 885,000 . Over the course of the twentieth century the population of the country grew by a factor of fourteen, the fastest growth rate in the Western Hemisphere. The ever-increasing pattern of emigration to the United States has led to the growth of Guatemalan communities in California, Florida, Illinois, New York, Texas and elsewhere since the 1970s. Although the official language is Spanish, it is not universally spoken among the indigenous population, or is often spoken as a second language; 21 distinct Mayan languages are still spoken, especially in rural areas, and Garifuna is spoken by a small number of people on the Caribbean coast. Xinca, a nearly-extinct non-mayan language, is also indigenous to Guatemala. The Peace Accords signed in December 1996 provide for the translation of some official documents and voting materials into several indigenous languages (see summary of main substantive accords), and mandate the provision of interpreters in legal cases for non Spanish speakers. The accord also sanctioned the teaching of bilingual education in Spanish and indigenous languages. It is very rare, however, for Spanish-speaking Guatemalans to learn or speak one or more of the nation's other languages. Roman Catholicism was the dominant religion during the colonial era, and remains the faith of about two-thirds of the population. However, Protestant denominations have increased markedly in recent decades, especially under the reign of dictator and evangelical pastor General Efraín Ríos Montt. Around one third of Guatemalans are Protestant - chiefly Evangelical and Pentecostal. The practice of traditional Mayan religion is increasing as a result of the cultural protections established in the peace accords. The government has instituted a policy of providing altars at every Mayan ruin found in the country so that traditional ceremonies may be performed there. There are also small communities of Jews (about 1200), Muslims (1200), and members of other faiths. The current Catholic leader of Guatemala is Mons. Rodolfo Quezada Toruño. The government runs a number of public elementary and secondary-level schools. These schools are theoretically tuition-free, but the cost of uniforms, books, supplies, and transportation makes them less accessible to the lower classes. Many middle and upper-class children go to private schools. Some of these schools are: Colegio Americano de Guatemala (CAG), Colegio Interamericano de Guatemala (CIG). The country also has one public university ( Universidad de San Carlos de Guatemala), and 9 private ones (see List of universities in Guatemala). The Guatemala National Prize in Literature is a one-time only award that recognizes an individual writer's body of work. It has been given annually since 1988 by the Ministry of Culture and Sports. Guatemala City is home to many of the nation’s libraries and museums, including the National Archives, the National Library, and the Museum of Archaeology and Ethnology, which has an extensive collection of Maya artifacts. The Colonial Museum, in Antigua Guatemala, has large exhibits of colonial artwork.